Reporting on your neighbor suddenly became a lucrative side business in China. The secret police force in Hebei Province recently issued a notice in the press advising that hefty rewards would be provided for citizens who informed on the religious activities of their peers—including those who signed their names to petitions or affixed their thumbprints to written protests against abuses by the police. 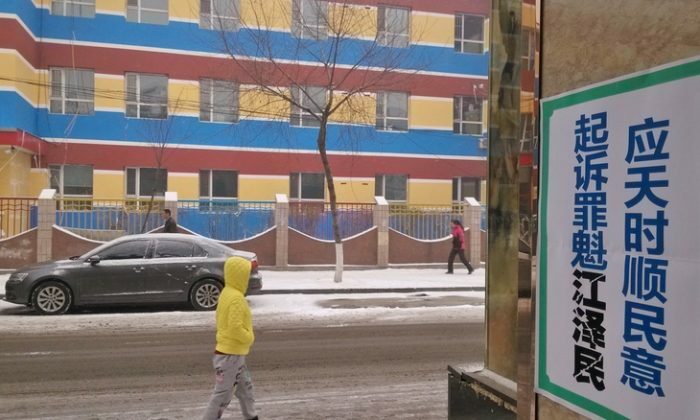 The notice was issued under the aegis of the Hebei Province 610 Office, whose official title is the Office for Preventing and Dealing With Heterodox Religions. The office, in fact, is a secret Communist Party agency that strictly speaking does not have a legal existence. It is the main agency in charge of the campaign to eliminate the Falun Gong spiritual practice, a traditional meditative discipline that has been targeted by Chinese authorities for 16 years. “In order to fully mobilize the masses to inform on illegal heterodox religious activities, to actively participate in safeguarding social stability, the provincial People’s Government Office for Preventing and Dealing With Heterodox Religions has decided, beginning today, to provide awards for reports about illegal heterodox religious activities,” the notice said. Such “activities” include holding banners and handing out flyers, CDs, pins, and similar items. Practitioners and supporters of Falun Gong in China hand out such material in order to raise awareness about the Chinese authorities’ violent persecution of the practice. Hanging banners—whether vertical, horizontal, small, or large—is also liable to be reported. Even talking to others about the persecution of the practice or its tenets—the core beliefs of truthfulness, compassion, and tolerance—falls under the prohibition and could attract police attention. Those who practice or express public support or sympathy with Falun Gong in China can lose their jobs and be sent to labor camps and jails, where they are tortured into forced confessions and repudiations of their beliefs and made to swear allegiance to the Party line. 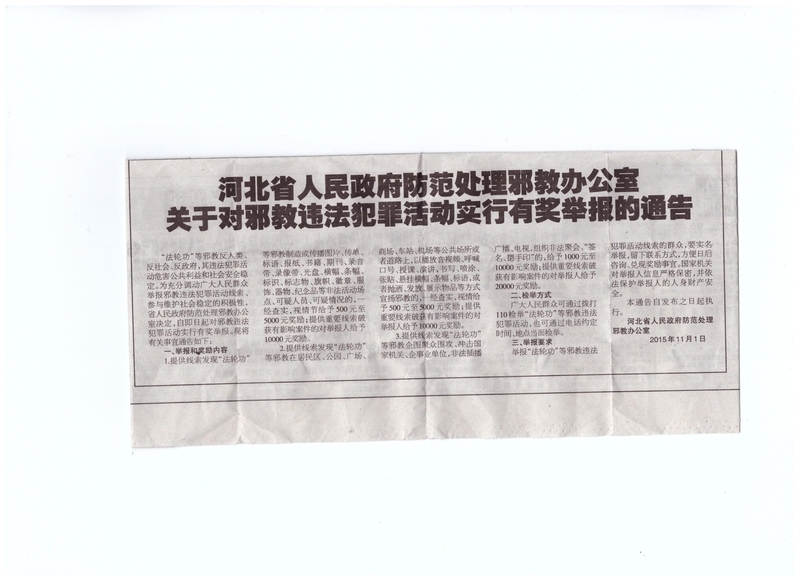 The notice calling for informants was published across various Hebei media, including newspapers, televisions stations, and online media sites throughout November. Monetary rewards provided are comparatively substantial: from 500 to 5,000 yuan for regular reports, but up to 10,000 for reports that lead to “breaking significant cases.” Such cases presumably refer to police raids of homes where printers are used to produce materials that describe the abuse and torture of Falun Gong practitioners. The motive for publishing the notice at this time is unclear. Such agitation and incentivization was common in the early years of the persecution, when propaganda authorities whipped up a feverish and hateful atmosphere of informing against Falun Gong practitioners. But the persecution campaign largely went underground around 2005 and received little mention in the press. Falun Gong practitioners in China have in recent years been emboldened by Xi Jinping’s anti-corruption campaign, which has taken direct aim at significant members of the Jiang Zemin faction, the group of officials who were promoted by the former Party leader who initiated the persecution against Falun Gong in 1999. These men, like Zhou Yongkang and Bo Xilai, built careers on the harsh implementation of Jiang’s anti-Falun Gong directive. The purge of these individuals—along with the marginalization of the 610 Office as a policy instrument at the central level—coincided this year with an unprecedented outpouring of criminal complaints against Jiang Zemin issued by Falun Gong practitioners, supporters, and family members from around China. In the city of Baoding, Hebei Province, for example, 1,350 citizens have filed criminal complaints against Jiang, according to Minghui.org, a website that carries first-hand reports about the status of the persecution of Falun Gong in China. Whether the Hebei notice was prompted in response to these activities is unclear. The implementation of the persecution of Falun Gong around China has always depended heavily on local conditions and the will of those charged with the policy. Particularly virulent officials—like Zhou Yongkang and Bo Xilai—pursued the campaign with uncommon vigor. In other places, officials, particularly front-line police officers, did the minimum necessary to keep their superiors from hounding them. Zhang Nanning, a professor of law at Southeast University, Nanjing, said in an interview: “This is obviously against the law. This is going above their authority. And it’s making a mockery of the official emphasis on ruling the country according to the law. “The law is supposed to punish criminal behavior, but Falun Gong is just a kind of qigong. It doesn’t hinder anyone and does not include any illegal conduct,” Zhang said. With reporting by Rona Rui. According to internal reports in the office responsible for persecuting Falun Gong in China, activity resisting the persecution is increasing. Party documents issued this year show that persecution of the traditional spiritual practice Falun Gong is still being carried out as official policy.